Run install, configure, and upgrade jobs for clusters, datacenters and nodes. Select the concurrency level at which jobs are deployed in LCM. Launch and monitor install, configure, upgrade, and import jobs for DSE clusters from the Clusters workspace of Lifecycle Manager. After Lifecycle Manager (LCM) successfully creates a cluster during an install job, LCM automatically adds the cluster to the OpsCenter workspace for monitoring and management. Importing a cluster topology is also tracked in the Jobs summary and details. 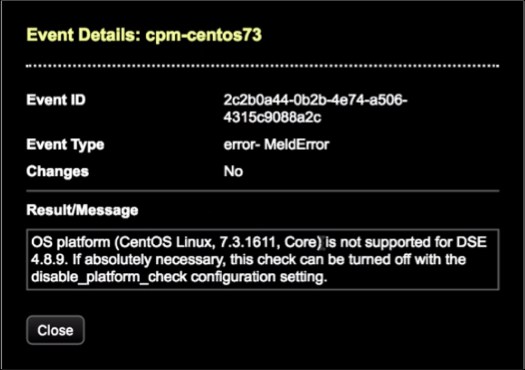 The OS platform check can be disabled at your own risk by setting the disable_platform_check option to True in the [lifecycle_manager] section of the OpsCenter configuration file, opscenterd.conf. For further instructions, see Installing a DataStax Enterprise cluster using Lifecycle Manager.